The Female Financial Empowerment program was started in Myanmar using concepts from our Credit Union Development program. The aim of the program is to develop the financial education of women in rural areas and provide the tools to empower them. This can be through support, financial services and business skills. Each village has their own local self-help group (SHG). Members of these groups gain access to a variety of basic financial services such as a savings account, microfinance and support. They learn about the community-owned banks as a part of the Credit Union Development program, outlining the structure and how they can benefit communities. A core part of the program is the financial literacy education. These are skills that can be applied throughout participant’s lives and the program teaches skills of a variance of complexities. Some of the more basic skills taught involve how money work and the basics of loans and savings. Once this knowledge is gained more complex topics are taught such as business management, finance, assets and much more. Additionally, through the program, Cufa also teaches a leadership skills workshop. This is especially important for female empowerment and this provides teachings away from the financial skills. The Female Financial Empowerment program provides an opportunity for women in rural areas to get together and access a support group. Subsequently, they gain empowerment through access to financial services, education and support but primarily also by coming together as a collective. 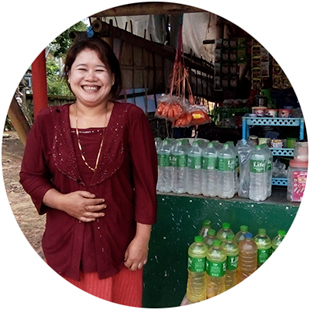 Daw didn’t know much about saving, financial skills and business skills until Cufa started a community-owned bank near her village. After this, she joined the self-help group provided by the Female Financial Empowerment program and was given the tools to start saving. The program taught Daw about loans, interest rates, savings and bookkeeping as well as providing general support. She took out a business loan and invested in her store making many improvements which she is now reaping the benefit.